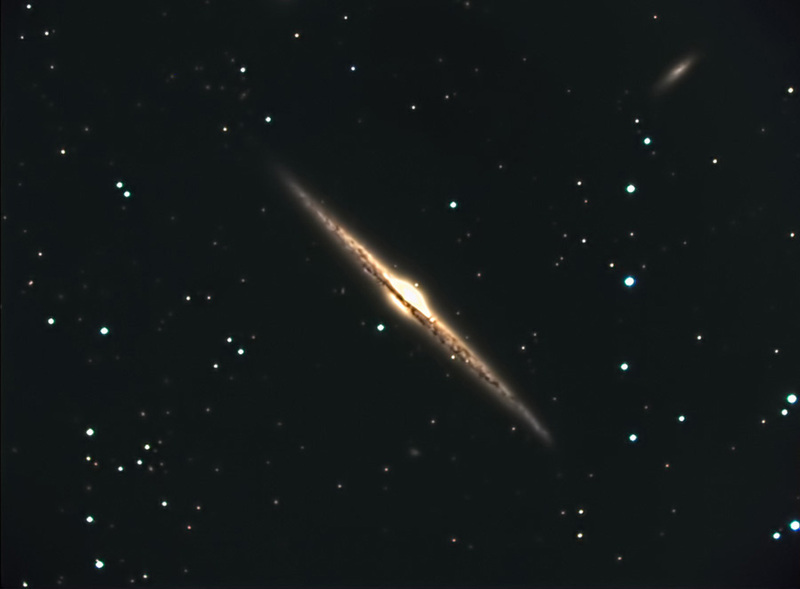 Due to its very thin profile, NGC 4565 is also known as the Needle Galaxy. It was first observed by William Herschel in 1785. It lies approxmimately 40 millioin light years away and span 100,000 light years. It is a fine example of an edge-on spiral galaxy. It is reported to be very luminous. If it were viewed face-on, it would appear brigher than the Andomeda Galaxy. The neighboring galaxy at the upper right is NGC 4562. It lies approximately 75 millioin light years away and also spans 100,000 light years. Luminance: 24 x 5 min. R: 5 @ 5 min. ; G: 5 @ 5 min. ; B: 6 @ 5 min. Images were focused, captured, reduced, and combined in MaxIm CCD. The Luminance and RGB images were combined and adjusted (Curves) in Photoshop. The RGB and L images were aligned in RegiStar and the composite created in Photoahop. Sharpening and noise reduction were done with Topaz Detail and DeNoise respectively. Shot from by backyard observatory in southeastern Minnesota on 5/30/14. Seeing was average for this region.